I'm sure I don't have to introduce readers of this blog to Hank Shaw. Shaw is the proprietor of the Hunter Angler Gardener Cook blog, which has been nominated for numerous awards and garnered two IACP medals. He's also—full disclosure—a friend of mine. Now Shaw has a new book out which is taking the foraging community by storm. It's called Hunt, Gather, Cook, which is a pretty good description of how he lives his life. You might add Write in there too, since he's been a reporter for two decades and understands how to bring the intricacies of the forager's metier to the general public—no small feat. 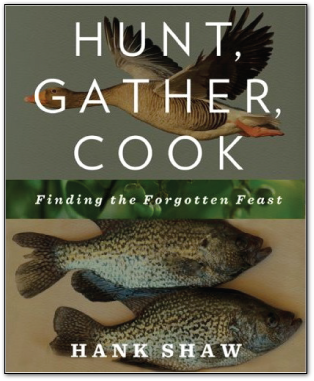 On its face, Hunt, Gather, Cook is an introduction to wild foods with recipes, but it's also a clarion call. Hank's web address is HonestFood.net, and that's what his main aim is: to show you how to eat well in way that stimulates mind and body, in an age dominated by watching rather than participating. Shaw answers an essential question—why bother?—at the very beginning of Chapter One. "First off, it's fun," he writes. "There's a certain 'wow' factor when you serve guests an elegant dish of, say, nettle pasta, or empanadas filled with cheese and lamb's-quarters, or dolmades made with mallow leaves instead of grape leaves." If you're happy pushing a grocery cart through fluorescent-lit aisles and choosing between the most colorful boxes of pre-fab food, then this book isn't for you (or maybe it's especially for you); finding your own food is about more than nourishment—it's about an activity that's good for the soul. There is satisfaction in growing a tomato that actually tastes like a tomato; in digging a clam and eating it on the same beach; in stacking your freezer with venison from a deer that died so that you can live. Growing, foraging, or hunting your own food is a reminder that, no matter what the cynics say, you are still a part of the natural world and the food chain. At one time, these pursuits constituted humanity's main job. Now we have other work to occupy us (like trying to monetize web sites), but food finding is still a basic need that satisfies an ancient desire. Enough proselytizing. So what's in the book? It's divided into three main sections: foraging plants, nuts, and berries; fishing and shellfish; and hunting. In the plant section Shaw covers stalwarts such as stinging nettles and dandelions but also more intensive aspects of foraging such as harvesting and processing acorns, not to mention fringe-like pursuits such as brewing madrone bark tea. In the fishing section Shaw shows his stripes as a former commercial clammer ("The sea is one of God's great cathedrals, and it is the one that most stirs me within," he writes in the chapter head). Entire books have been written just about fly-fishing with sub-surface flies, so a few chapters devoted to the sea can only be a starting point, but even so there is good advice here for beginners, for instance on deep sea fishing: "Ocean fishing is one of the few areas where being a do-it-yourselfer isn't always the best idea." Charter a boat, he recommends. There are chapters on crabs, panfish, and even "misfits" such as eels, blowfish, and oyster toads, whatever those are (Shaw fries them). The last section, on hunting, perhaps best encapsulates Shaw's notions of honest food. He came to hunting late in life, though he's learned enough to stock his freezer mostly with game meats and he's lost his taste for store-bought beef. This is also the section in which Shaw feels a need to explain himself, because, let's face it, the world is full of people opposed to hunting. "I've learned more about how and why nature does what she does in a morning spent hunting in the marsh or forest than most could in a year," he writes. This section is aimed squarely at that emerging demographic of urban weekend warrior thinking about purchasing his or her first hunting rifle. Shaw covers the basics on small mammals, large mammals, upland game-birds, and waterfowl. There is also a chapter on wild boar and charcuterie. 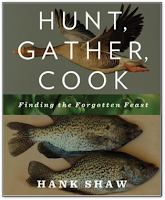 Hunt, Gather, Cook is not so much a field guide as it is a primer to whet the would-be forager's appetite. Those looking for color photos and point-by-point identification are advised to look elsewhere (and it should be mentioned that there is no such thing as a single reference guide to foraging in North America; even regional guides cannot be entirely comprehensive, to the dismay of some book buyers who expect all this information between two covers). Instead, Shaw's book provides the raison-d'être to go out and get your own food as well as a healthy dose of inspiration in the form of anecdotes and asides. The recipes are a diverse mixture of down home, far-flung, and cheffy. The overall effect is that of a friendly mentor taking you by the hand to reveal the hidden splendors of nature's pantry. Shaw will be in Seattle to promote Hunt, Gather, Cook for the next few days, with an action-packed itinerary of dinners, talks, and other events. You can read more about his book tour here.